Chocolates flavors subject to availability. This box is designed to give chocolate enthusiasts the option to pick out the perfect box of chocolates! 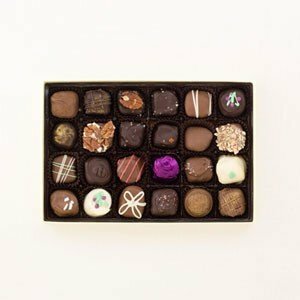 Choose from our large selection of truffles, creams, caramels, and more! All hand dipped in our small factory in Montana. 1.Browse our large selection of chocolates. There are detailed descriptions of each chocolate under "All About Chocolate"
We give you the option to choose all the 24 pieces. If you would like only a few varieties in the box fill only a few of the drop down boxes. Example: You want a box with just the Raspberry, Orange, Lemon, and Cherry, select the top four tabs as those varieties and we will send a box with six of each type of chocolate. 3. Place your order and we will ship your order as soon as we can*. *We make our chocolates in small batches, due to this factor we may run out of some off the chocolates that were selected. If you would like your box sent quickly, regardless of what chocolates we have available to fill it, select "Send Promptly"
Otherwise, we will send your box to you as soon as we have made more of the 'out of stock' selection. has been flavored with pumpkin spices.